It’s been said that one dreamer breathes life into the next. We have embraced the dream and vision of a transformed Roman Catholic Church. Now it’s time for us to continue to breathe life into that dream to keep it alive for generations. Your donation will help make the dream and vision a reality. Here are some ways you can donate to Mary Magdelene Apostle Catholic Community (MMACC) a 501(c)3 non-profit corporation (Federal Tax ID Number: 26-0136035). Using your Visa, MasterCard, or American Express to make a gift is a growing convenience for donors. To make an immediate gift by credit card, please click on the Donate Now link in the photograph on this page. 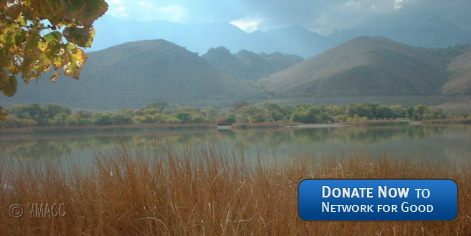 Note: Network for Good is a secure online donation system that has served over 60,000 nonprofit organizations. To find out more about their service, visit www.networkforgood.org . Some of our donors find it convenient to have their bank send monthly checks directly to MMACC from their bank accounts. It has been our experience that banks generally do not charge for this service. We also welcome in-kind donations of special skills, services, certain items needed for our community. If you have skills, services or items you would like to donate, please call, email, or complete the Contact Us Form. Planned giving, sometimes referred to as gift planning, may be defined as a method of supporting non-profits and charities that enables donors to make larger gifts than they could make from their income. While some planned gifts provide a life-long income to the donor, others use estate and tax planning techniques to provide for charity and other heirs in ways that maximize the gift and/or minimize its impact on the donor's estate. Thus, by definition, a planned gift is any major gift, made in lifetime or at death as part of a donor’s overall financial and/or estate planning. Below you will find a listing of the many ways you can make a planned gift to MMACC. Stocks: Giving stock is an excellent way to support MMACC. You avoid capital gains taxes and get full value as a charitable deduction. To transfer your stock electronically, send a letter to your broker or banker stating you wish to transfer securities to MMACC. Specify the type of stock, the number of shares that you are donating, whether your gift is unrestricted or for a specific purpose, and the date by which the gift should be transferred (two to three business days is normal). Your letter should also include information which we will provide you. Please call, email, or complete the Contact Us Form regarding the gift and provide information as to what and how much is being transferred. We will provide you with transfer instructions. Bequests: Making a bequest in your will or living trust is a common and efficient avenue of support. You make a contribution without reducing your assets during your lifetime. The bequest can take the form of a specific dollar amount, a percentage of your estate, or a particular asset. Retirement Plans: You may designate MMACC as a beneficiary for an IRA, TSA, Keogh Plan 403(b), 401K and other qualified pension and profit-sharing plans. Donor-advised Funds: A donor-advised fund allows you to make an irrevocable contribution to a charity for later distribution to qualified organizations. Generally, the donor can specify which charities he or she wishes to receive donations, although the final decision rests with the sponsoring organization. You'll be entitled to an immediate income-tax deduction for your contribution, subject to certain limitations, even though the funds won't be distributed until a later date. If your donation consists of appreciated securities, you'll avoid capital gains taxes on those assets. Your donation to the fund will also reduce the value of your estate, which may potentially save future estate taxes. Organizations generally accept cash and other securities, and, occasionally, real property. You'll want to find out what types of assets the sponsoring organization will accept. Funds may also have minimum contribution requirements or grant amounts. Make sure you know the fees that are involved, the restrictions that apply to grants, and the donor services the organization offers. Ask if the fund will continue after your death. A fund that continues allows you to create a lasting legacy. Life Insurance: Gifts of life insurance provide a way to make a sizeable gift at a relatively low cost. Such a gift can be made by either delivering and assigning ownership of the policy to MMACC or naming the institution as the beneficiary. An outright gift of a paid life insurance policy naming MMACC as the irrevocable owner and beneficiary, allows an immediate tax deduction equal to the replacement value of the policy. Partially paid-up policies allow for a tax deduction equal to the cash surrender value of the policy. Real Estate: An outright gift of a residence, vacation home, ranch, commercial building or vacant land (entirely or fractional interest) can be an excellent way to support MMACC. You can also "gift" your personal residence and retain life interest-gift of life estate - the ability to live in it for the remainder of you and your spouse's lives. This also applies to second or vacation homes that are used as personal residences. Charitable Trusts: Establish a charitable trust (charitable remainder trust, charitable lead trust, charitable remainder annuity trust) and you may receive income for life from the trust assets. You will also gain significant tax benefits that could include reduction of capital gains taxes as well as an immediate tax reduction. Funding a charitable trust with highly appreciated assets such as real estate or stocks is ideal. Charitable Gift Annuities: MMACC can offer competitive rates for gift annuities. In return for your gift, you receive annual payments, a part of which is tax-free. The rate of return may be significantly higher than many other fixed-income investments. Gift annuities may be funded with cash or marketable securities and they provide significant tax benefits. Tangible Personal Property: Gifts of tangible personal property may consist of furniture, equipment, books, gems, precious metals, art, stamps, coins, fixtures or nearly any kind of property. For more information on ways to give to MMACC, please Contact Us. We recommend that you also confer with your attorney and financial advisors to assist you in selecting the best gift opportunities for you and your family.